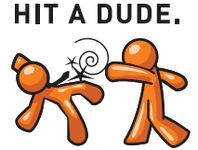 ENnie Award-submitted Hit a Dude was created by Ryan Macklin, and released as a free game at Gen Con 2011. Hit a Dude was a great success, with over 350 copies floating around at the convention, and stories of people having loads of fun playing the the ultimate game designers' game. You can download the entire game at the official Hit A Dude website!